*Enter the following information to make your booking. At Mr Car we offer you a personal & professional service, keeping in mind that "Our client's satisfaction is our best guarantee to success". 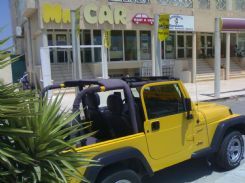 Mr Car rent a car has a wide and modern infrastructure throughout all the Costa Blanca. You can choose from a basic compact vehicle through to medium, family size (estate), luxury or even 7, 8 and nine seaters. Thank you for visiting Mr Car.es; our staff will be happy to help with any request or querries you might have... feel free to send us an e-mail.